Long before the Frenchies Bistro & Brewery first opened its doors in 2017, the company’s founders, Vince and Thomas, wanted to hit the ground running and generate a bit of awareness about their new brand. 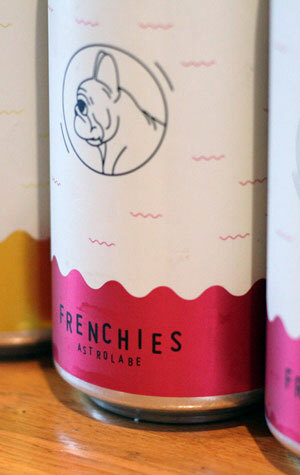 The most tangible thing they figured they could do to help get some traction behind Frenchies was to release some beers. So, in 2015 Vince began gypsy brewing around Sydney, testing the market with a little range of European-inspired styles they hoped would fit in with the venue they would ultimately open. What he first came up with was an IPA that used slightly obscure old world hops, a traditional Kolsch and a witbier: Blanche. While all of these had roots in roughly the right part of the world, they were more German than Gallic. What the Frenchies needed was a flagship, something was was a bit more, well, French. Enter the Astrolabe. This was a bière de garde, a style originating in Northern France that was especially notable in the Sydney scene because it’s not a style many, or any, local brewers chose to make with any regularity. Frenchies’ version was further differentiated due to it being a deep red colour, rather than the more traditional gold. And it was a luscious beer, with a smooth and rich body full of sweet caramel and toasted malts, where fruity yeast esters mixed and matched with flavours of stone fruits. It tasted just like the kind of complex, food-friendly beer you imagined they would want to be serving at their dining tables. Then they stopped brewing it. Fast forward to the beginning of 2018 and the bistro was up and running and they’d put the brewery through its paces with a gamut of new beers and a redeveloped range. The one thing that was missing from the beer offerings was Astrolabe. So it was welcome news to see it make a return, tasting better than before and with the extra good news that it is now part of the brewery’s year round beers – and in big cans too. Calling a particular beer a brewery’s "best" is too subjective an exercise – like comparing Edith Piaf with Daft Punk – but, given the chance to sip on an Astrolabe from a fancy glass at their venue, you can’t help but feel this is exactly the kind of beer the Frenchies set out to make when they started their journey. Frenchies Feast every Thursday at the long table, $95 set menu includes all food and bottomless beer (max 20 people).